Barcelona manager Luis Enrique has played down the first El Clasico of the season, saying Saturday's game with Real Madrid will not be "decisive". Leaders Barca travel to the Spanish capital with a four-point La Liga advantage on their arch-rivals. Barcelona are yet to concede a La Liga goal in 2013-14, while Real have scored 25 in their past five league games. "There are still a lot of games to play and I don't think the game will be decisive," said Enrique. Both sides are in Champions League action before next weekend's eagerly-awaited game at the Bernabeu. Real visit Liverpool on Wednesday, 24 hours after Barcelona host Dutch champions Ajax. "We will be going to Real to win, as we have done over the last few years," added Enrique after his side beat Eibar 3-0 on Saturday. "But right now I just want us to rest and recover." 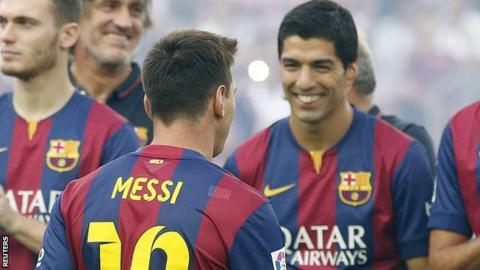 Barcelona striker Luis Suarez is eligible to make his competitive debut for the club in Saturday's game. The 27-year-old, who joined from Liverpool for £75m in the summer, has served a four-month ban for biting Italy's Giorgio Chiellini during the World Cup. Team-mate Lionel Messi will become the all-time leading goalscorer in La Liga if he scores twice at the Bernabeu. Real talisman Cristiano Ronaldo has scored 15 times in seven La Liga games this season, including two in his team's 5-0 win at Levante on Saturday. Asked about next week's game, Barca midfielder Javier Mascherano said reigning champions Atletico Madrid pose as much of a threat to his side's title ambitions as Real. "The pressure against Madrid is always the same," said the 30-year-old former Liverpool and West Ham player. "We'll be playing our big rival, though we mustn't forget Atletico either. "We thought they would slip up last year, but they took the title in the end."